nothing can stop the Duke of Earl..."
During the fall of 1961, Gene Chandler recorded The Duke of Earl, a song he co-wrote with Earl Edwards and Bernice Williams. I was nineteen years, in my first year at St. Johns River Community College, thinking about... well you know what I was thinking about. In November 1961, Duke of Earl was released. In 1962, it held the number one spot on the charts for over three weeks. Today the song is in the Rock and Roll Hall of Fame as one of the 500 songs that shaped rock and roll. In 1962, I finished my first year at the local community college, and Daddy, so impressed with my grades, let me enroll at Alabama College (now known as The University of Montevallo) about thirty-five miles south of Birmingham and five hundred miles from our home in north Florida. 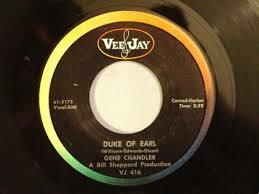 Gene Chandler still sings, tours, and walks through the world like the Duke of Earl, because he is the Duke of Earl. I lasted only one semester at The University of Montevallo (too many diversions and too few monitors). Today I'm seventy years old. I've been a professional speaker, and a minister. I've been married four times and divorced three. I am a student of all things esoteric, a runner, a businessman, a writer, and a husband (the best one I've ever been, and I appear to be getting better). A few minutes ago, while cutting the grass and listening to my iPod, The Duke of Earl blasted through my headset and into my head. This time I really heard it, even above the sound of the lawn mower. Everything we do matters, and everything we do not do matters as much. It all leaves a trail, our history, whether we are aware of it or not. Why not do it all well, knowing, like the Duke of Earl - "Nothing can stop me."